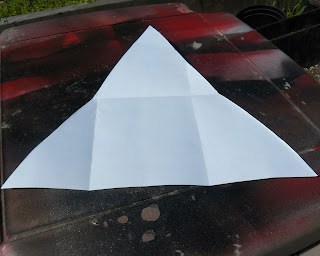 This is going to be a tutorial with a LOT of photos for a very simple project because the start of learning how to do this is learning how to fold and cut an equilateral triangle for a pattern out of any size rectangle of paper. In the near future there should also be a video made by my daughter. 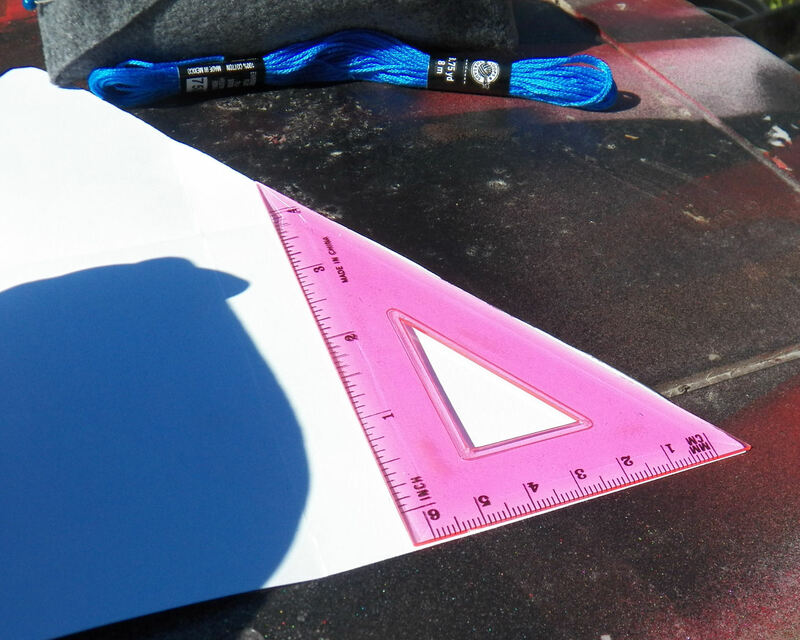 The angles of any triangle add up to 180°. 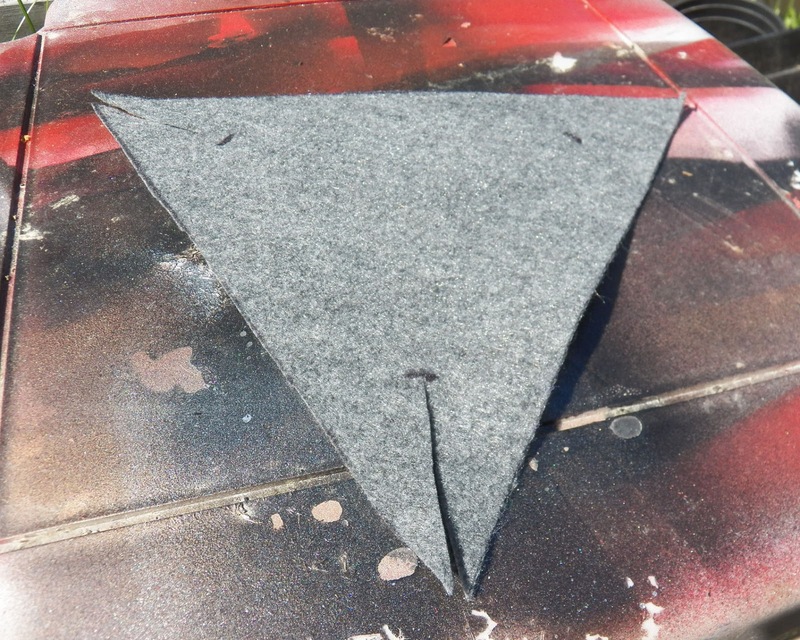 For an equilateral triangle, that means each angle is 60°. 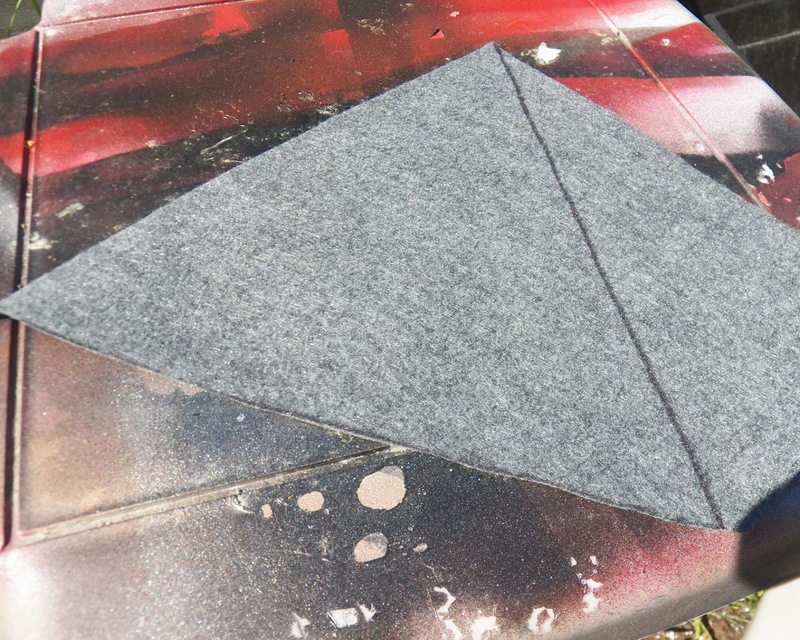 Folding 90 and 45 degree angles is easy, here you will learn how to fold a 60 degree angle. The table I'm working on is a small poly table that was originally bought as a side table for sitting outside to put my iced coffee on. It became the surface my daughter used to spray paint all sorts of things for her costumes and projects. 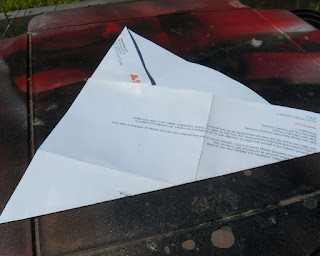 The sheet of paper is a piece of junk mail from an insurance agent. We get so many of them that they get used for shopping lists, paper patterns and all sorts of other scratch paper purposes. Reduce, reuse, recycle!! 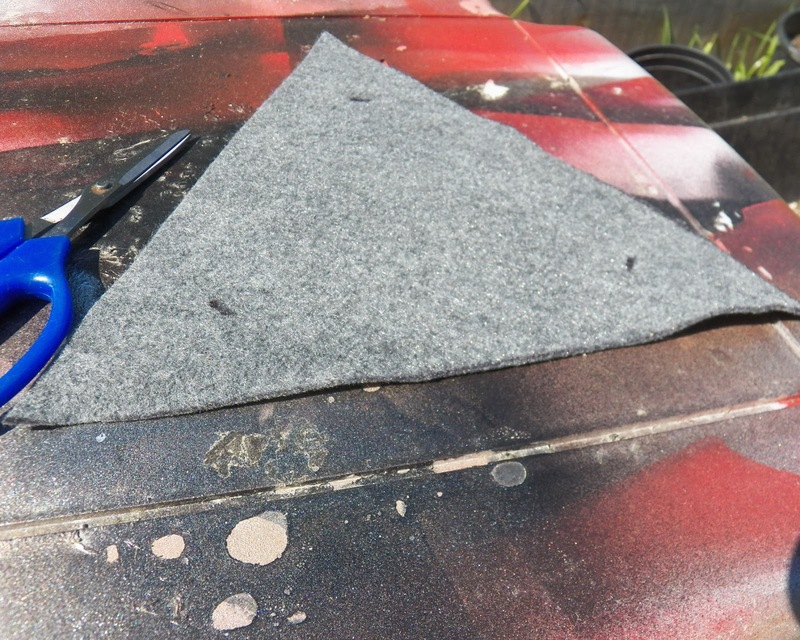 This project can be done with felted sweaters, craft felt, even fun foam. Anything that won't ravel and has a bit of body. It makes a fantastic sewing project for kids. 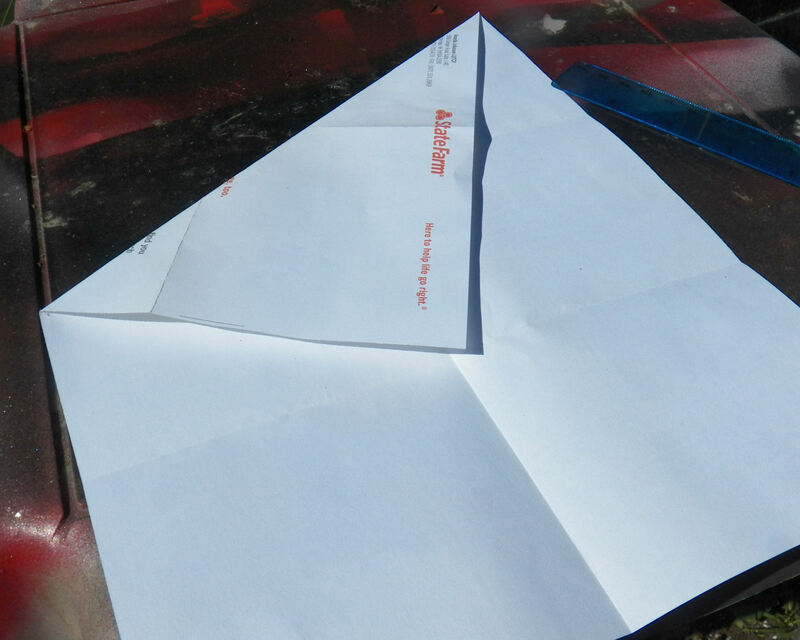 Start by folding your sheet of paper in half lengthwise- or like a hot dog if you learned it that way! And unfold. 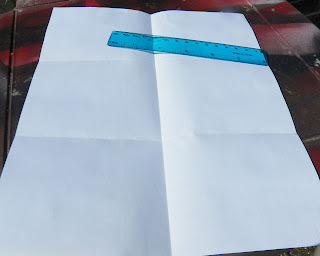 Now you're going to take one corner, and fold it into the center, the top edge of the paper from the corner you're folding should be a line down to the other corner. Now fold the other side over the open edge of the angle you just folded. 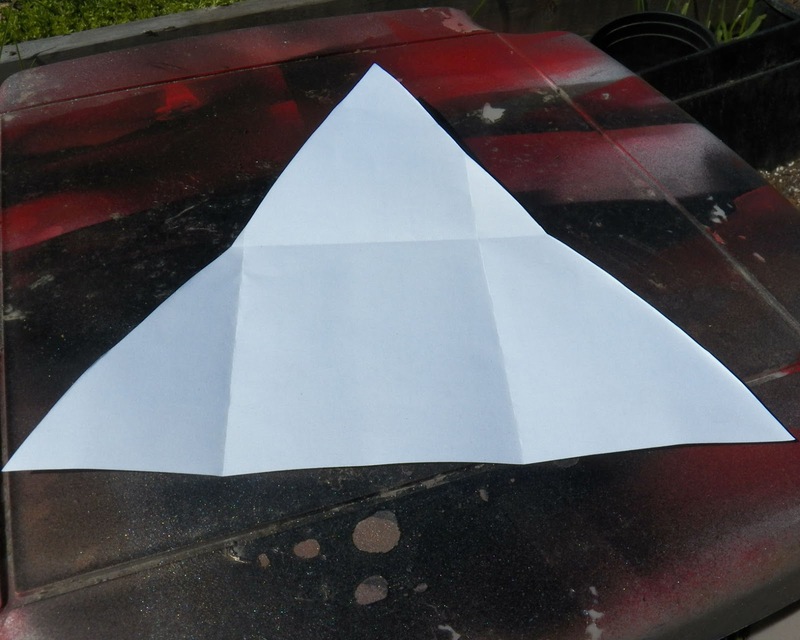 When you unfold it, you'll have two lines to cut to make the triangle. I used this 60° angle to show the angle you got with your folds. Now trace your shape on your fabric, and cut it out. Now it gets really easy. You're going to cut into the corners bisecting them to make the sides. To figure out the depth of your finished box, you'll measure from the center to the edge perpendicular to the center line. 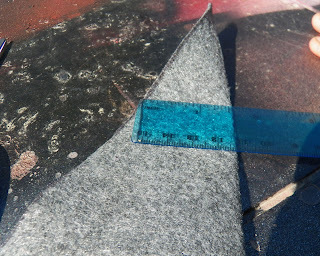 Measure in from each corner and mark them all the same length. Cut a straight line down each one. Now you'll pin each corner, make sure the outside flaps are all facing in the same direction, and pin the cut edges so they match up with the top of the basket on the facing edge. Now you can choose how you'll stitch it. 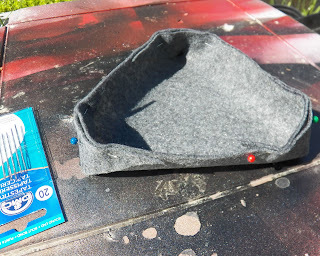 For the gray basket, I only stitched the top edge. 6 strands of embroidery floss will fit in a size 20 tapestry needle. 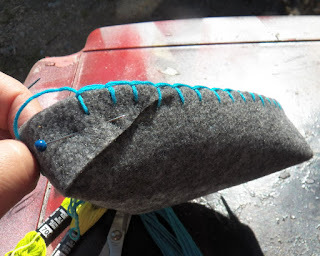 Blanket stitch or whip stitching work for the edge. 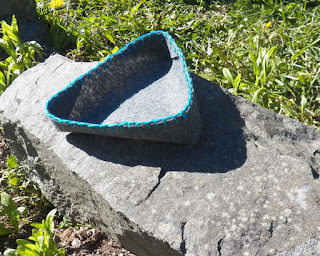 Here's the finished gray basket. 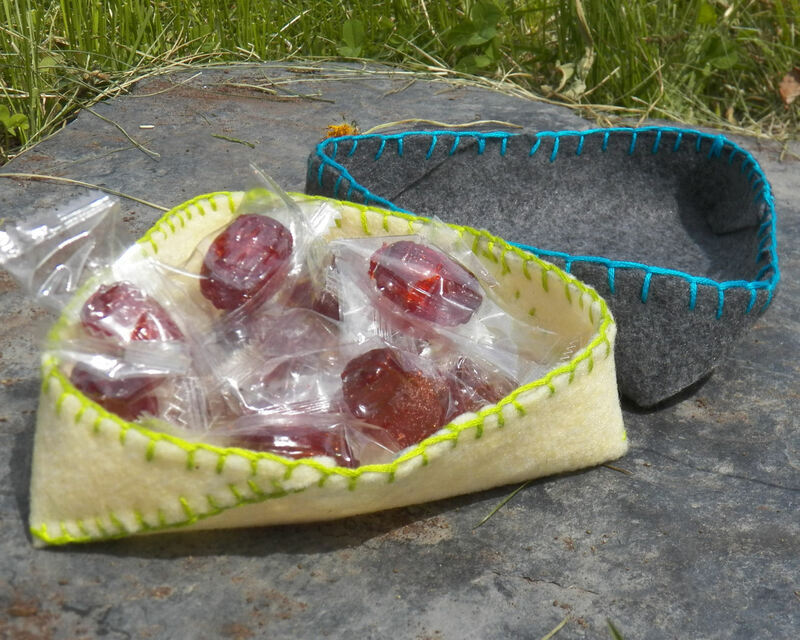 For the cream basket, I stitched the outer corners on the side that showed on the outside, then stitched the top.